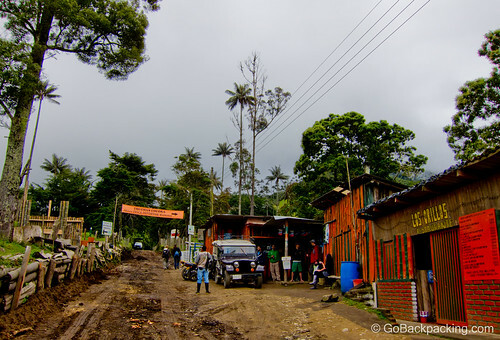 Entrance to hiking trails in Valle de Cocora. Last month I met a horse named Canario, and if I had my way, that horse would retire from shuttling tourists around, and live out the rest of its years chomping fresh, green grass under the towering wax palms of Valle de Cocora in central Colombia. Extreme horseback riding wasn't on my agenda when I arose early one morning at a dairy farm turned hostel outside Salento, a pueblo in the heart of Colombia's coffee growing region. Upon arrival the prior day, I'd kept to myself, aside from talking to a German guy in the bunk bed next to me who'd spent five hours hiking around in the mud and rain to see hummingbirds. Early morning view of the wax palms. After taking in the views of clouds drifting through the mountains around the dairy farm, while sipping a fresh cup of coffee, I walked the 10 minutes down a dirt road into Salento's main square. There, I waited for the 9:30am share jeep to Valle de Cocora, a nature preserve home to Colombia's national tree, the wax palm, which also happens to be the tallest type of palm tree in the world. While I was waiting, the Colombian manager from the Base Camp hostel in Manizales showed up, along with the French guy that had been working there during my stay. They were wearing rubber boots in preparation for the mud to be encountered during the full 5-hour hike. I was still feeling content with my plan to hop out of the jeep, photograph the palms, have lunch, and and head back to Salento within a few hours. Then a friendly young Aussie walked up in shorts and flip flops. Followed by two Swiss girls. And suddenly we were all crammed in the back of an old jeep, speeding down a mountain road, onto a bumpy unpaved one, toward the entrance of the valley. During the journey, we introduced ourselves and got to know each other, as happens so effortlessly when sharing such experiences. By the time we arrived thirty to forty minutes later, a group dynamic had developed, and before I knew it, we were picking out horses to ride during the first half of the trail. The cost was about 18,000 pesos each ($10), which included payment for a guide (required when taking horses). There were no helmets; no insurance waivers to sign. Once we were all on our horses, mine's name being Canario (Canary), I declared in Spanish to my new friends that I had very little horseback riding experience. In fact, my last ride was almost two years prior — a gentle trot through Storms River, South Africa. Luckily, horses such as these have the same routine every day, so they simply follow each other, and are familiar with the guide's commands (usually relayed via whistling). The Swiss girls were experienced riders, as was everyone else in comparison to me. The Australian guy was riding barefoot. As we set off down the trail, the horses all fell in line, and we were soon passing through farmland, on a narrow, deeply rutted trail. Canario managed to balance himself on the thinnest sections of mud, and traipsed through large puddles of water without hesitation. Sometimes another horse would speed up behind us, and as if to ensure none of them would pass, Canario would speed up too. I'd immediately try and calm him down, but it took some time for me to relax and enjoy the passing scenery without images of falling off a runaway horse passing through my mind. 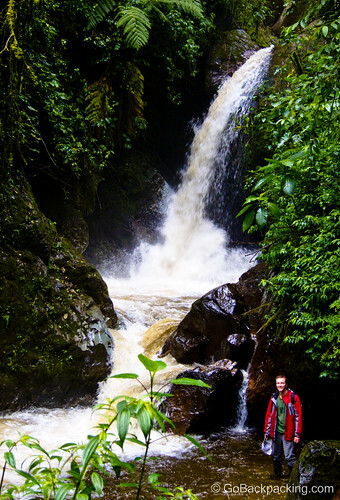 Stopping by a large waterfall on the trail through Valle de Cocora. After about thirty minutes, we left the open farms of the valley for the cover of the jungle. Due to the region's climate, it rains a lot, and therefore the trail was wet and muddy. We were soon navigating around very steep terrain (both going up, and more frighteningly, down). The Swiss girls commented that their (pampered) horses in Switzerland would never be able to handle such rugged trails. Meanwhile I was thinking that this ride was about ten times more dangerous than any other I'd been on (going back to when I was a kid and rode a little more often in New Jersey). The rocks and deep sections of mud were one danger, but it was the river crossings that had my anxiety levels maxing out. We crossed the same river in the jungle about 4-5 times, and each time it seemed the water was deeper, and moving faster than the prior crossing. The water level was just below the bottom of my stirrups, and as it was muddy, there was no way to tell where it was best for the horse to be walking. They just followed each other in a line. One misstep, and I was going to be chucked into freezing cold water. On one or two occasions, I'd also probably have been swept over a small rocky waterfall to boot. My camera, in a nylon drybag, could easily be destroyed, along with a few of my bones. 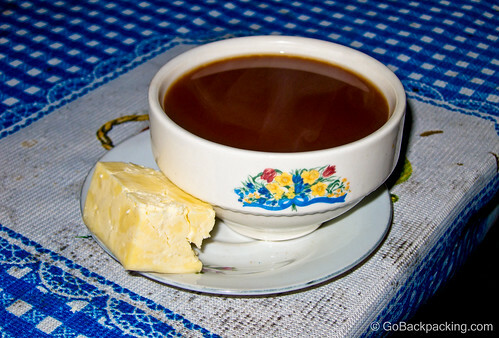 Hot, unsweetened chocolate, and cheese were a welcome treat after 2 hours on the horses. Even scarier than the river crossings on horseback were the state of the “bridges” if you were hiking that section of the trail. Usually they consisted of a few moldy logs. One of them was a moss-covered, rope suspension bridge, complete with broken floorboards like you'd see in an Indiana Jones movie. When I saw them, I was thankful to be riding Canario. And despite all my anxieties, I trusted Canario didn't want to fall down either , and would therefore be taking as much care as a horse knows how to take. After an hour and a half or two, we dismounted and walked another few hundred meters up to a small guest house perched above the trail. 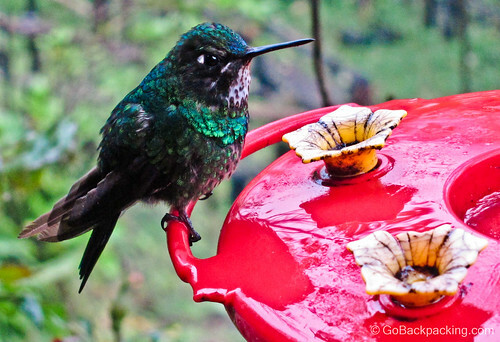 Home to an array of hummingbird feeders, and a Colombian man, it was a regular rest stop for those on the trail. Our group warmed up with the hot chocolate, and large chunks of cheese. Those familiar with local customs will break up the cheese and add it to the chocolate — a delicious treat after more excitement than I bargained for that morning. We were at 2,800m, and it had begun to rain. Our motley crew included (from left): Swiss, an Aussie, a Frenchman, a Colombian, and an American (me, not pictured). The Australian, when given the choice between hiking the remainder of the trail in flip flops or barefoot, started to go barefoot. Between the mix of mud and horse manure on the trail, it was an unthinkable (and dangerous) proposition to me. But he had no other choice. The Colombian girl had been on the receiving end of a kick from the French guy's horse just before we arrived at the house. A giant bruise was swelling up on the outside of one of her knees. A hummingbird sits still long enough for me to get a quick photo. To finish the trail, we would be on foot for the next three hours. Already having experienced the type of terrain we'd encounter on horseback, I knew I was in for a muddy mess, especially with the rain starting. The elevation couldn't be ignored either, as it was not something we felt while the horses were doing the physical work. Would the barefoot Australian make it out alive? Would we get lost due to the poorly marked trail? Would the views of the valley be worth the effort at the end of the day? This post brought back great memories. I was just in Colombia a week ago, and my friend and I had a very similar experience hiking through Tayrona. 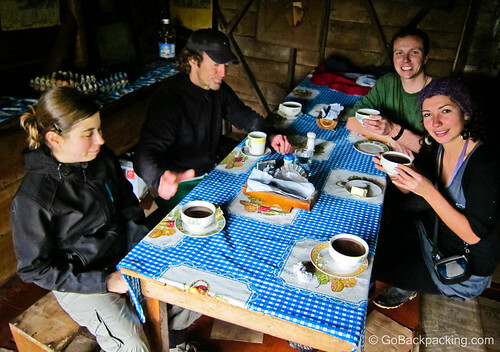 Mud and horse dung-laden paths, bare feet, seemingly random pit stops for refreshments… not to mention the mosquitoes! I only hope I didn’t pick up any random diseases on those trails; the experience was priceless, nonetheless. Cool April — luckily mosquitoes weren’t an issue in Cocora. I hope to see Tayrona when I come back next year. Hey Andi, it was a lot of fun and I loved the choco and cheese! This post brought back great memories. When I went horseback riding in Colombia (Nevado del Tolima) I remember warming up with agua panela, obleas and large chunks of cheese too. I had such a fun time! This adventure remains one of the best souvenirs I have from that country. Hola Eugenie, glad you enjoyed the experience too. 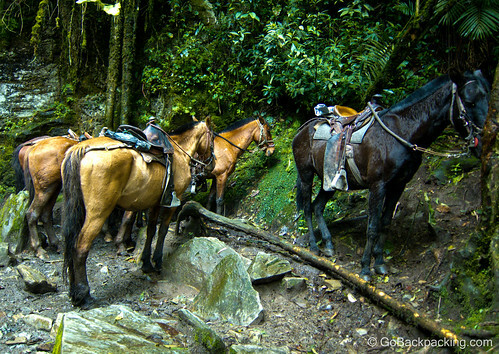 Horseback riding is a must when in Colombia. I have fond memories of both my times (the other was in the mountains above Jardin). A group of us got quite sick from eating that cheese and/or hot chocolate (I think it was the cheese)!! So anyone going, please beware and perhaps skip the cheese and bring your own snacks instead. If it is homemade/locally made, I’m assuming the hygiene and storage practices aren’t quite ideal…. As soon as we returned back to the trailhead where the trout farm and restaurant is, several of us started vomiting profusely for the next few hours. I had to go to the hospital in Armenia and get IV fluids because of the the severe dehydration! I recovered fully after about a day and a half. NOT FUN, but the hike was spectacular!! Hey John, sorry to hear you got a bad batch of cheese. For everyone reading, you can get chocolate and cheese at restaurants throughout the country (as I later would in Bogota). Opened this post, seen the picture of Entrance to hiking trails in Valle de Cocora. I now feel like I was there yesterday. But it was almost 7 years ago! 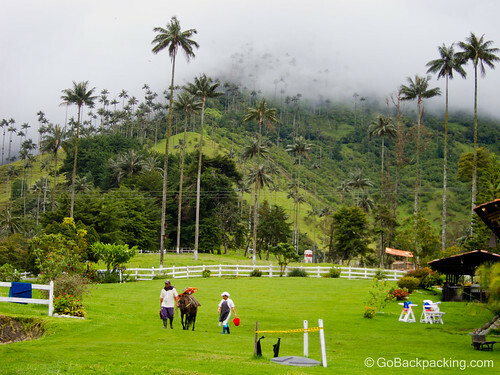 Nice post, Valle de Cocora and Salento are definitely quite and beautiful places. You trek sounded amazing !!!! I am in Colombia now and am looking to go up into the Zona Cafetera next week and would love to recreate our horse riding/hiking trip, Who did you arrange this with ? or is it more something that you arrange as you arrive in the area ? Matt – I didn’t do any advance planning, I just took a share jeep in the morning from the main plaza of Salento to the valley and rented a horse once I got there. You just need to find out what time the share jeeps leave from the plaza, which you can do at whatever hostel or hotel you stay at.